"Computer sharing is quite common in much of the world," said Joyojeet Pal, a lecturer in UW Computer Science & Engineering who has studied technology adoption in rural India, Rwanda, and the slums of Brazil. Despite this, though, practically no learning technologies accommodate sharing, Pal said. This month the team will test the system, called MultiLearn, with 180 students who are attending two government-run elementary schools in rural India. "Children show dominance patterns when they sit in front of a machine," Pal said. "If there are three to five children, then the child who is the smartest and from the most affluent family controls the mouse." In 2006 Pal worked with Kentaro Toyama at Microsoft Research India helping to connect multiple mice to a single computer so that many users could share control of the screen. That product, MultiPoint, is now used by an estimated 20,000 children. But point-and-click with a mouse does not work well for math problems. UW undergraduate students in Pal's course decided to build a similar system for a numeric keypad. MultiLearn was developed over the past year by undergraduates Clint Tseng, Heather Underwood and Sunil Garg. 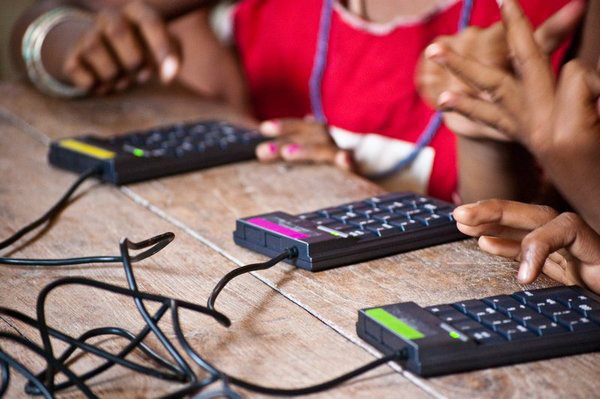 Their system connects four numeric keypads, each of which costs about $4, to a computer. The screen is split into four columns. Each student looks at one column, where he or she is given math problems based on performance on previous answers.